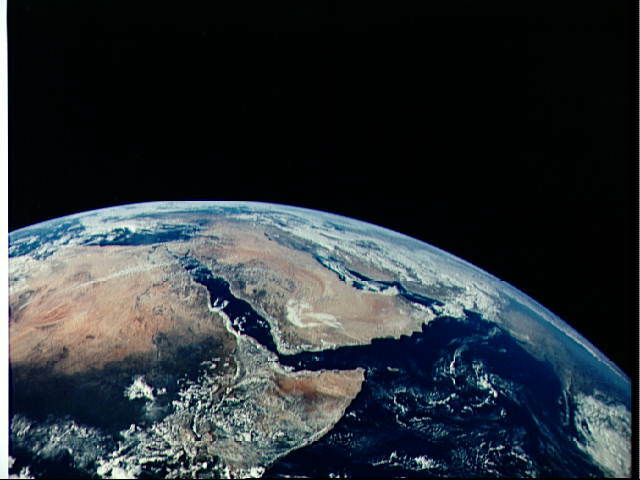 View of Saudia Arabia and the north eastern portion of the African continent was photographed by the Apollo 17 astronauts with a hand-held camera on their translunar coast toward lunar landing. Egypt, Sudan and Ethiopia are some of the African nations visible. Iran, Iraq and Jordan are not so clearly visible because of cloud cover and their particular location in this picture. India is dimly visible at right of frame. The Red Sea is seen entirely in this one frame. The Gulf of Suez, the Dead Sea, Gulf of Aden, Persian Gulf and Gulf of Oman are also visible.